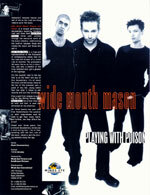 Wide Mouth Mason is a high-end representative of the thousands of Canadian bands that hit the road with dreams of a rocket ride to stardom. The pretenders fall away, the so-so toil in obscurity, and only a handful of the truly talented ever get a glimpse of the big stage. It’s the twisted road to the top that is at the heart and soul of this documentary. It’s all about the music and the money: those at the top of the business want a piece of any hot, young talent that has what it takes to sell records and turn the turnstiles. From a gold first release to opening for the Rolling Stones, Wide Mouth Mason has proven they can do both and that is what has attracted all the attention. For three twenty-two year olds from Saskatchewan the question is: what compromises must be made to get their music heard, and further, can they afford the price? Filmed over three years, this profound documentary chronicles a band during their rise to fame, revealing both the dark side of the music industry and the shining moments along the way.